The Sri Lanka Parliament and the House Democracy Partnership of the U.S. House of Representatives launched a Collaboration Agreement to strengthen partnership between the two legislatures today, 14 September, in Washington D.C. 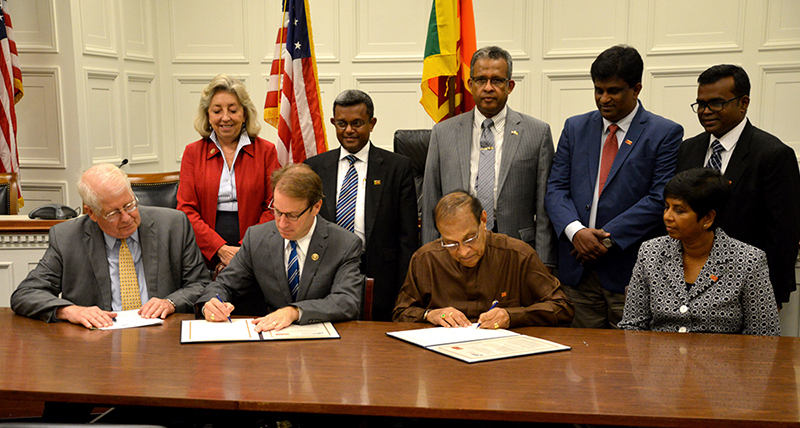 The Agreement was signed by the Speaker Karu Jayasuriya and Representative Peter J. Roskam, Chairman of the House Democracy Partnership on behalf of the Sri Lanka Parliament and the House Democracy Partnership respectively. The collaboration between the two legislatures is based on the principles of facilitating the exchange of information on the legislative systems of each country, sharing knowledge, and offering consultations on effective legislative management; and cooperating and assisting each other through training programs for the members and staff of the legislatures. The signing of the Agreement was preceded by a roundtable conversation among the members of the House Democracy Partnership and the visiting parliamentary delegation of Sri Lanka led by the Speaker. Speaker Jayasuriya was joined by Ajith P. Perera, Deputy Minister of Power and Renewable Energy, Karunaratne Paranavithane, Deputy Minister of Parliament Reform and Mass Media, Dr. Sudarshini Fernandopulle, State Minister of City Planning and Water Supply, Dhammika Dasanayake, Secretary General of Parliament and Sri Lanka’s Ambassador to the United States of America, Prasad Kariyawasam. HDP Chairman Peter Roskam and Ranking Member Congressman David Price, both reflected on the strong bilateral ties that Sri Lanka and the United States have traditionally shared and the potential to further deepen relations through collaboration under the HDP. They were joined by Congresswomen Diane Black and Dina Titus, who signaled interest, particularly, in working with women parliamentarians. Speaker Jayasuriya observed that the political transformation in Sri Lanka since the Presidential and Parliamentary elections last year and the formation of the National Unity Government have ushered in a new era for the Sri Lankan parliamentary system. He explained in detail democratic reforms undertaken by the Parliament during last 12 months. The Parliament, sitting as a Constitutional Assembly, is in the process of drafting a new Constitution, which is expected to be finalized next year. He thanked the HDP membership for the initiative to collaborate with Sri Lanka under the partnership. A bipartisan, twenty-member commission of the U.S. House of Representatives, the House Democracy Partnership works with partner countries to develop accountable, effective and independent legislatures. Partner states are eligible to participate in training seminars for staff, peer-to-peer exchange programs with the U.S. House of Representatives and receive capacity building assistance in critical areas such as constituent relations, legislative oversight, committee operations, research and library services. The converging power of the forum in bringing together American legislators and their peers from around the world, makes the initiative an invaluable tool in the process of strengthening democratic institutions worldwide.